Trying to learn how to use this feature as i have projects that have migrated to their another Commcare instance. I was trying to upload cases into a registration form using this tool, it tells me its was successful but when i try to perform a form data export on the registration survey its says ‘0 submissions’. When using the Submit History feature, it also doesn’t show any of these records. 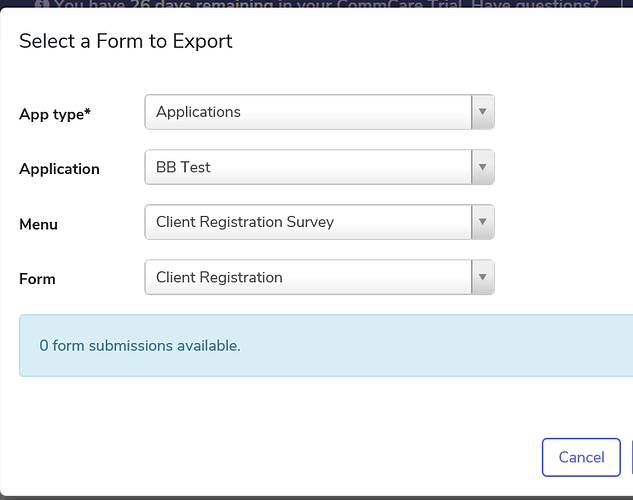 The case import doesn’t submit any of the forms from an app. It creates forms dynamically that only contain the case transactions required to create / update the cases in your import. To find the forms that were submitted you can filter the report to only show forms submitted by your username (the one was logged in when you ran the import). Thanks for the swift response, permit me to give more insight on what i am trying to accomplish. Previously we had a couple of projects sharing the same space in Commcare but now we have some projects that have purchased their own Commcare spaces. I have moved over their surveys but the question is now how to move the data hence why i tried to import the data using the case import tool. Beneficiaries have already been registered using the previous app and they definitely won’t want to re register them again because we moved to a new app and the data is very critical for the reports i am running in Power BI. Right now, i have uploaded the registration file as a separate file in Power BI and then connecting that to the data flowing in from Commcare but i am not sure if this approach is sustainable. Sorry for the slow response. We don’t have any way to migrate data between project spaces. Cases can be exported and imported but form data is not so easy. If it’s really essential to migrate the form data it’s possible to download the original form XML and then re-submit it to the new domain. The challenge here is that you’d need to make all your IDs to the new domain e.g. user IDs, location IDs, case IDs.